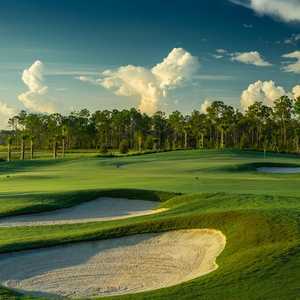 BONITA SPRINGS, Fla. -- Tom Fazio must have been a happy camper when he first scoped out the 1,034-acre site in north Naples where he would build Bonita Bay East's two golf courses that would wind through a pristine Florida landscape of marshes, wetlands, grasses and maritime forests. Bonita Bay East's Sabal Course borders a wildlife preserve. Fazio didn't have to think about routing the tracks around houses or through neighborhoods. These courses, the Sabal and the Cypress, were to be homeless in Bonita Springs. Today there are still no housing developments, tennis courts or other manmade contrivances here to distract from the pure golf experience. Even the low-key clubhouse looks more like an eco-lodge than a golf facility. Of course there are distractions like the devilishly daring raccoons that make lightning-quick raids on golf carts escaping with everything from half-eaten sandwiches to cameras. There are also moss-draped oaks, slash pines, spreading cypress trees, sabal palms and waving grasses. Rafters of turkeys skitter from woods to fairways; cormorants spread their coal-black wings to dry them in the breeze; and herons, egrets and even eagles perch on trees. You see carp the size of whales and even an occasional wild cat or a black bear loping across the fairway. It's no wonder that the Bonita Bay East courses are certified as Audubon Signature Sanctuary courses. 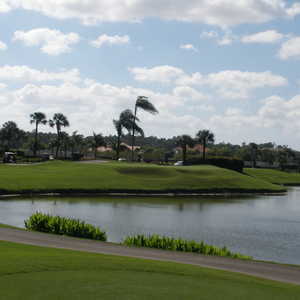 Bonita Bay East's Cypress Course opened in 1997, while the Sabal Course followed in 1998. Today, playing either course is to evoke Old Florida. "These are pure beautiful courses with plenty of wildlife, friendly deer and knock-out scenery," said Kevin Kreutz, the assistant professional at Bonita Bay East. "They are in great shape with the best greens in southwest Florida." The Sabal and the Cypress, along with three other golf courses designed by Arthur Hills located in the Bonita Bay West residential development, are amenities of the member-owned Bonita Bay Club. Although the Sabal and the Cypress were open to public play until March 18, 2013, they are now completely private. If you want to play them in the high season, you'll need to play with a member, but local golfers gets a break in the summer and can tee up at Bonita Bay East if they belong to a local golf club. Both courses feature TifEagle greens and rolling Celebration Bermuda fairways, but each has its own personality. The longer of the two courses, Bonita Bay East's Cypress Course leads off with wide fairways punctuated by strategically-placed bunkers on the front nine to tighter landing areas on the back with some holes cut through dense stands of trees. Generally, the Cypress is considered the course to play for those looking for the ultimate challenge. You'll find more behemoth bunkers along with plenty of wetlands and water. Among the big challenges on the Cypress are the slick-running greens. Some like no. 11 run long from back to front, while no. 8 is small and slides to the lake. The 17th green is shallow and falls off the back. The par 3s are exceptional. For example, the fifth is long at 231 yards from the tips (137 from the front) and can be tough, especially if the wind is blowing. There is nowhere to go but the green. "I like Cyprus," Kreutz said. "Last year we redid all the fairways so they look great. When you get out on the back, you're in the trees all out there by yourself with the deer and the wildlife. … The 18th is a beautiful test requiring two pure shots to reach a green guarded by water and bunkers." Just a tad shorter and tighter than its sibling, Bonita Bay East's Sabal Course borders a wildlife preserve. Long white sand bunkers flank undulating fairways and ponds cut in to provide challenge and interest, especially on holes 9-12 that play around a 35-acre lake. "That's pretty cool," said Kreutz, noting that holes 9 and 11 follow the entire length of the lake, causing you to think twice before you stray too far from the center. Named for its abundance of graceful sabal palms located throughout the landscape, the Sabal features steep bunkers, multi-tiered greens with false fronts and terraces and sloping bunkers as found on hole no. 6. The Sabal also has five par 5s and five par 3s. The Sabal's risk-and-reward holes include no. 18, a par 5 inviting longer hitters to reach the green in two. Fall short or off course and you're in the water or the bunker. Bonita Bay's Cypress and Sabal are refreshing departures from Florida development courses that snake through residential neighborhoods. When you play Bonita Bay East, you feel like you're in Old Florida -- just you, your clubs and nature. If natural is what you are looking for, this is it.